Sunday August 11th 1895 It was an intensely hot day. Laura and I went to church. I read in the afternoon. Frank and Lif Stevens came down about five oclock. I got supper while Will did chores they stayed till bed time. Thursday August 9th 1895 We ironed this forenoon and got dinner. We went to town in the afternoon, was over home awhile. came home to do evening work. Monday August 12thy 1895 Laura helped me wash this morning and I then got the dinner. I ironed all our things in the afternoon and did sweeping and scrubbing. 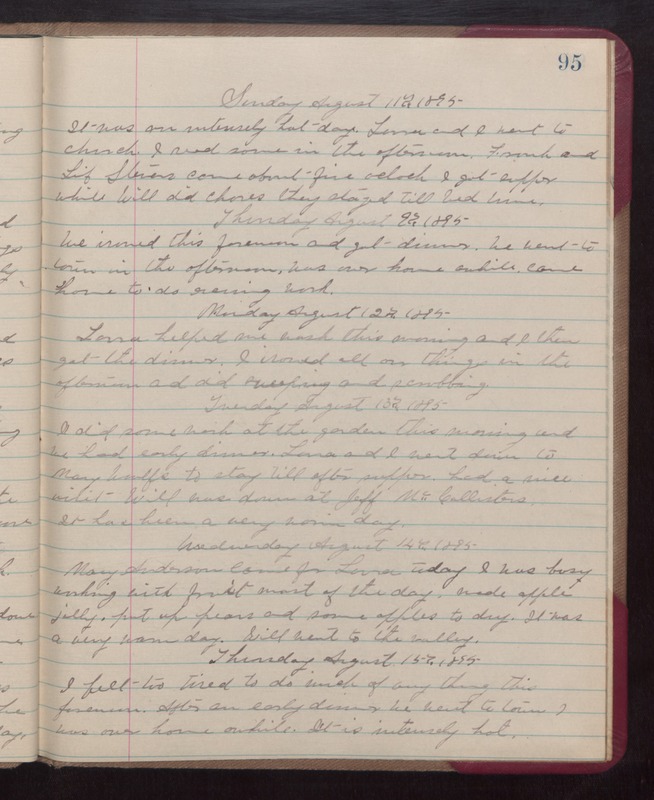 Tuesday August 13th 1895 I did some work at the garden this morning and we had early dinner. Laura and I went down to Mary Woolfs to stay till after supper. had a nice visit. Will was down at Jeff McCallisters. It has been a very warm day. Wednesday August 14th 1895 Mary Anderson came for Laura today. I was busy working with fruit most of the day. made apple jelly. put up pears and some apples to dry. It was a very warm day. Will went to the valley. Thursday August 15th 1895 I felt too tired to do much of any thing this forenoon. After an early dinner we went to town. I was over home awhile. It is intensely hot.